The C3 Pro helmet has always had the best engineering and componentry under its shell. One of the most quiet, aerodynamic and comfortable helmets on the market today, it is the venerable “Cadillac” of helmets. It has been incredibly popular with the sport touring and long-distance guys who aren’t afraid to flip open the chin bar and let their grey beards feel the breeze. The new graphic lineup dusts off the old-guy image in favor of a more purpose-oriented look. 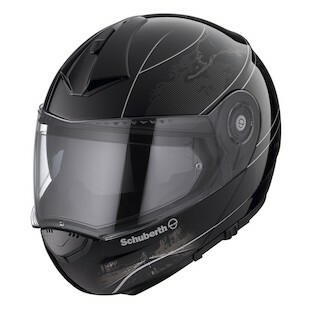 For the world traveller, the Schuberth C3 Pro North America Graphic should be a popular style. It features a map of the continent across the sides and back of the helmet. It also has images of a lonely road in the American Southwest and the Brooklyn Bridge and Statue of Liberty in the Northeast. It also has a series of tasteful stripes bringing the design together from front to back and it is available in either black or white as well as men’s and women’s versions. For the riders putting the “sport” back in sport touring, the Schuberth C3 Pro Intensity Graphic is just that; intense. The black base is highlighted by white stripes and the main color, either titanium or blue, is accented with a subtle pattern. Each of the lines were selected to highlight the shape of the C3 Pro. The design definitely doesn’t take the helmet over the top in terms of taste but it is far from bland. 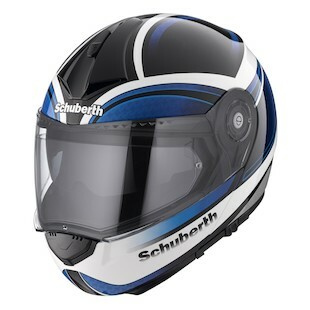 For the riders with motorcycles in their blood, the Schuberth C3 Pro Racing Graphic is ideal. Two words. Blood. Red. Rock it on any color bike you’d like but be ready to make some heads turn. This color screams aggression. 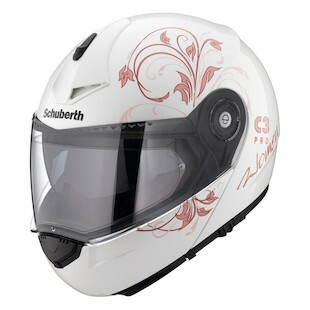 For the lady riders (or pillions), the Schuberth C3 Pro Euphoria Graphic brings out the inner princess. The C3 Pro Women’s helmet is more than just a case of “shrink-it, and pink-it.” Instead of just making the helmet smaller internally, Schuberth has thoroughly researched female heads and facial shapes and restructured the inner lining accordingly. Now the legendary Women’s C3 Pro comes in an ultra-ladylike flower graphic. It is nice to see Schuberth settling in to the US market after a few years. We hope to see more colorways each season as they expand.